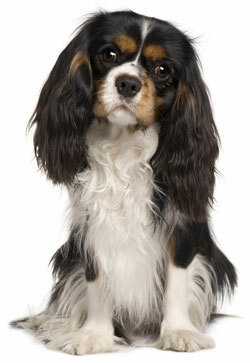 The Cavalier King Charles Spaniel is a gentle, sweet, loving, happy, playful, wonderful companion. He will greet you with tail wagging and ask for cuddles, and he wants to be with you all the time. He's can't be left alone for long, because he needs to be with his family. He's a bold and active little dog who doesn't require strenuous exercise, but who does like to have his ball tossed in a fenced backyard, and to go out for regular walks--always on a leash, so he won't be tempted to chase small animals. He's extremely social and gets along well with other dogs, cats, and pets. He makes friends so quickly that he doesn't make a very good watchdog! He's a good-tempered dog who is generally easy to train, as long as his lessons are gentle and he gets lots of praise and rewards for his efforts. He is exceptionally good with children, being very playful and patient with them. He's devoted to his family, and gives as much affection as he receives. He will shed some hair around your home. The Cavalier King Charles Spaniel is 12 to 13 inches tall (to shoulders) and weighs 10 to 18 pounds. He has a medium-length, silky coat. His coat color can be black and tan, black and white, chestnut, or reddish-brown. The ancestors of Cavalier King Charles Spaniel were popular for centuries as luxurious lapdogs for aristocrats and nobility, and became increasingly prized during the reign of King Charles II of England. The breed was refined however by an American breeder who came to England in 1920s to find the perfect spaniel. The first Cavalier King Charles Spaniel arrived in America in 1952; his breed was admitted to the AKC in 1996. His AKC popularity was 25th out of 157 breeds in 2007.